If you are wondering about a better, more natural way to solve your dog or cats health problems, you're in the right place. If you're worried about too many vaccines, the toxins in commercial pet food, or the side effects of conventional drugs, and you're looking for safer options, you're also in the right place. Most pet owners and veterinarians know very little about natural remedies to heal your pet at home. These are treatments which are Safe, Natural And Effective- and they often come with far fewer side effects than the strong pills sold by Big Pharma. I'll show you precisely what you can do immediately to both prevent and treat diseases in your dog or cat; you'll be using my holistic tips and remedies with simple easy to follow instructions. "Dear Dr. Jones,Thank you very much for your wonderful, informative book. I have used the Chinese herbal formulation for recurrent urinary tract infections and finally have my dog's urinary infections stopped!! I would rate this ebook at 5 PAWS!!! Best regards,"
"'Veterinary Secrets Revealed' is a book that is long overdue. Dr. Jones has provided a go to guide for many aliments that plague our animals. The best thing about this book concerns its focus on boosting health rather than just treating symptomology. I am always looking for safe, effective ways to booster my cats health, and Dr. Jones has provided this information for various diseases and conditions experienced by animals." "I love your book. I having been waiting for a Vet like yourself who uses a natural healing and common sense approach to taking care of my animals. This also allows me to be empowered and involved in their care. Thank you for sharing your knowledge and making it simple and easy to understand!" Dr. Andrew Jones was raised on a farm in rural British Columbia, Canada. He grew up reading James Herriot books, which were stories about the life of a mixed animal veterinarian in rural England. These humorous stories inspired the young Dr. Jones and painted a picture of a dedicated vet and a fulfilling life. Since graduating with his DVM from the University of Saskatchewan in 1992, Dr. Jones has been practicing as a small animal veterinarian and has treated thousands of animals (* Dr. Jones is no longer practicing, as he has resigned from the College of Veterinarians of BC – please go here for more information). 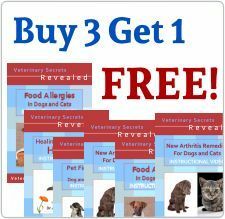 He has a special interest in a variety of alternative, non-traditional remedies for pets and has written pet-health books, countless articles on at-home pet health care, created a Home Study Course for dog and cat owners, and formulated premium nutritional supplements for dogs and cats (Ultimate Canine for dogs and Ultimate Feline for cats). He is the former owner of the Nelson Animal Hospital, in Nelson BC. Dr. Jones’ pets, Lewis, Jesse, and Cleo and Gussie, are a part of his family. This philosophy of animals being members of the family is applied to his work as well, in both his practice and in his online business; his client’s pets are a part of their family and they deserve the best care possible.